CINRG developed a standardized muscle strength testing system called the CINRG Quantitative Measurement System (CQMS). This system integrates many strength and function assessments (refer to list below) into one system with direct data entry onto our electronic data capture (EDC) to increase accuracy and efficiency. The quantitative muscle testing (QMT) portion collects measurements of force using a load cell while performing a maximum voluntary isometric contraction. This set-up is able to measure changes in strength of 0.25 pounds and thereby provides accurate and sensitive force generation measurement, especially in children. 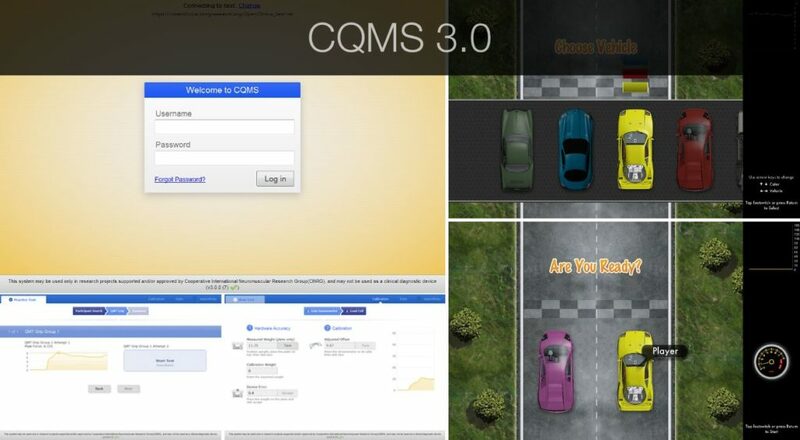 The QMT system interfaces with an audiovisual feedback providing motivation to yield the greatest efforts by participants. The audiovisual feedback interface turns the strength measurement process into a ‘video game’, leading to increased compliance and reliability. CINRG is constantly searching for improved methods and measures to more accurately gauge a patient’s disease progression and has been at the forefront of research in clinical outcome measures. For more information on CQMS please contact us at info@trinds.org.